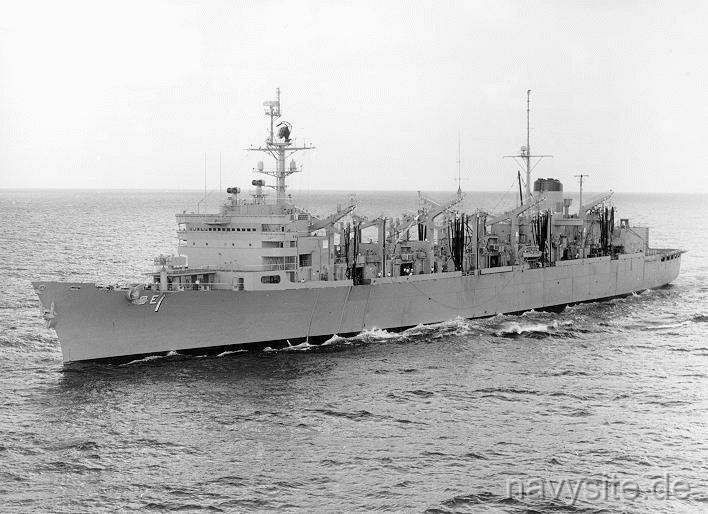 USS SACRAMENTO was the lead ship of the SACRAMENTO - class and was the first ship in the Navy to combine the functions of three logistic support ships in one hull - fleet oiler (AO), ammunition ship (AE), and refrigerated stores ship (AF). USS SACRAMENTO was the third ship to bear the name of the capital city and river in the State of California. 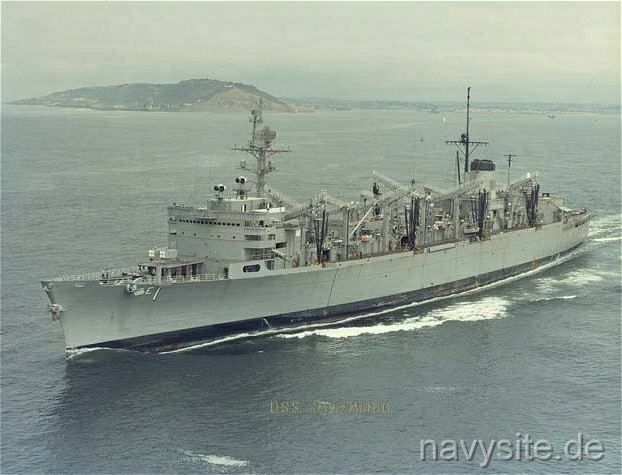 Both decommissioned and stricken from the Navy list on October 1, 2004, the SACRAMENTO was subsequently laid-up at the Inactive Ships On-site Maintenance Office, Bremerton, Wash. On April 13, 2007, the SACRAMENTO was sold for scrapping to Esco Marine at Brownsville, Texas. The ship was subsequently towed there. Builder: Puget Sound NSY, Bremerton, Wash. This section contains the names of sailors who served aboard USS SACRAMENTO. It is no official listing but contains the names of sailors who submitted their information. 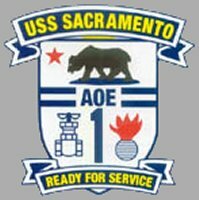 Click here to see which USS SACRAMENTO memorabilia are currently for sale on ebay. When built, SACRAMENTO carried more fuel than the largest oiler and more ammunition than the largest ammunition ship in the U.S. Navy as well as a significant portion of the supplies that a stores ships could carry. Later, SACRAMENTO carried (95% fully loaded) 5.2 million gallons of rnarine distillate fuel and 2.7 million gallons of aviation jet fuel. SACRAMENTO was also capable of carrying over 6 thousand tons of all types of ammunition, 300 tons of refrigerated provisions, 500 tons of dry provisions and 150 tons of other supplies. While not normally loaded, SACRAMENTO carried 220 different items (dry and refrigerated) and 120 other items when deployed. 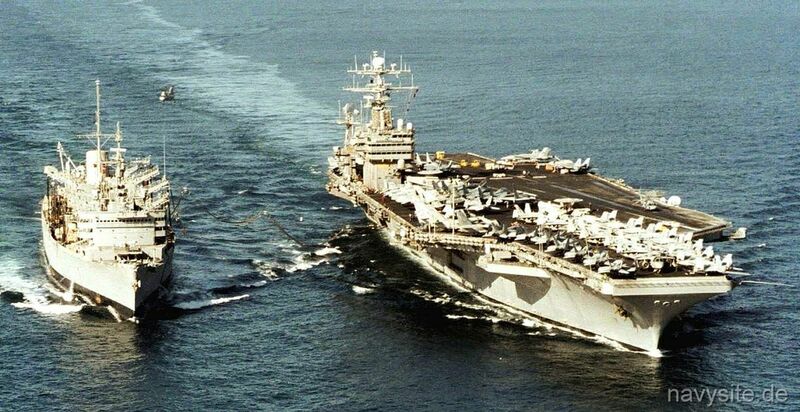 June 5, 1995 Persian Gulf USS ABRAHAM LINCOLN (CVN 72) and the USS SACRAMENTO collide during an underway replenishment. The LINCOLN is able to continue on her mission while the SACRAMENTO is heading for Jebel Ali, U.A.E., for several weeks of repairs. SACRAMENTO was originally equipped with the first Fast Automated Shuttle Transfer (FAST) system to handle ammunition and stores. FAST relied on the use of cranes to move missiles and cargo containers on weather decks and hoists to move cargo from the 01 level to the main deck. In 1977 SACRAMENTO's elevators were modified to lift cargo directly to the 01 level and the FAST cranes, transfer rails, and hoists were removed. The new system allowed cargo to be moved from hold to elevator to transfer station using standard electric fork truck and was far less prone to equipment malfunctions. 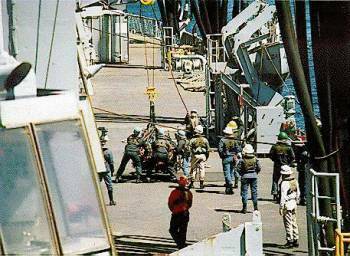 In addition the modern Standard Tensioned Replenishment Alongside Method (STREAM) unrep system was installed. Fuel was delivered through four double and two single hose (STREAM) fuel lines which were fed by large turbine driven cargo fuel pumps capable of supplying fuel at 40 to 120 psi at a maximum flow rate of three-thousand gallons per minute per pump used. This process is termed FAS for Fueling At Sea. Cargo, ammunition and supplies were moved vertically over seven decks (weather deck, cargo handling and staging deck and five levels of cargo holds) by seven different elevators. Elevators one through six serviced the four ammunition holds and number seven elevator and a package conveyor serviced the provisions hold (hold five). The supplies were moved horizontally by a fleet of 33 fork trucks of various types and sizes which allowed breakout, positioning and stowage of cargo and ammunition with efficiency. Cargo was delivered by four heavy and three standard lift STREAM cargo stations or by a detachment of two CH-46 helicopters which deployed with the SACRAMENTO. 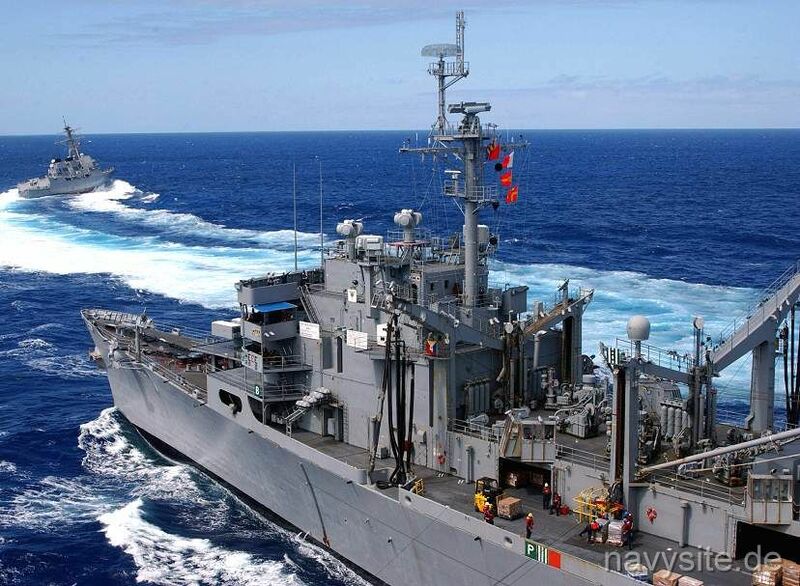 The process of resupplying a ship alongside by means of a fuel or cargo station is termed CONREP for connected replenishment. The two helicopters (SACRAMENTO had hangar space for three) were CH-46 "Sea Knight" combat support helicopters. They added another dimension to SACRAMENTO�s ability to transfer freight, mail, personnel, provisions and ammunition termed VERTREP for Vertical Replenishment. 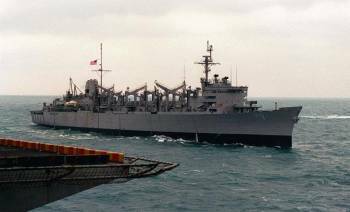 The VERTREP capability allowed SACRAMENTO to resupply ships in a dispersed formation, reducing alongside replenishment time, and allowing transfer of cargo over greater distances. 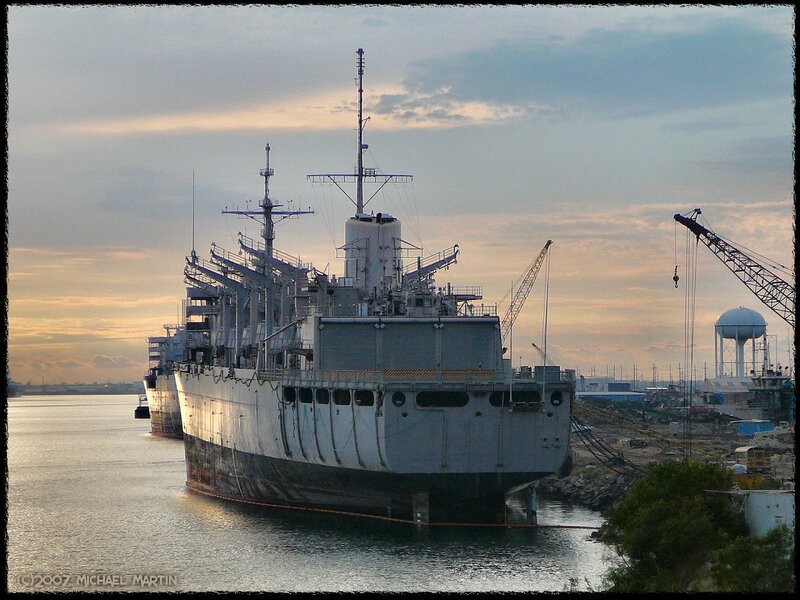 The photo below was taken and contributed by Michael Martin and shows the SACRAMENTO at Esco Marine, Brownsville, Texas, waiting to be scrapped. The photo was taken on November 19, 2007.